Theories of rational inattention argue that individuals incur costs when they look for information, and that they compare these costs with the expected benefits from that information. This column uses empirical evidence on online logins to bank accounts to show that in this context, attention tends to be selective – subject to an 'ostrich effect' that avoids the discovery of bad news, for example – rather than rational. This selective attention may intensify individual financial problems such as debt traps. Standard theories in economics predict that information is always valuable because it helps individuals make better decisions. In contrast, theories of rational inattention argue that individuals incur monetary or opportunity (time) costs of information acquisition that they compare with the expected benefits. Rational inattention has been used as an explanatory mechanism in recent theoretical work on asset pricing and macroeconomics. Woodford (2009), Reis (2006), Gabaix and Laibson (2002), and Van Nieuwerburgh and Veldkamp (2009) are examples of this. But people also seek out apparently useless information or avoid useful information (see Golman et al. 2016 for a survey of the research on this topic). Research into information-dependent utility argues that information also has a direct impact on utility that goes beyond information costs and benefits (Caplin and Leahy 2001, Golman and Loewenstein 2015, Kőszegi and Rabin 2009, Ely et al. 2015, Van Nieuwerburgh and Veldkamp 2010). There is, however, not much empirical evidence to answer this question. In particular, we still don't know whether theories of rational inattention or theories of information-dependent utility are more successful in explaining everyday behaviour. We use online account and smartphone app logins to measure individual attention. This method has previously been used by Sicherman et al. (2015), Karlsson et al. (2009), Gherzi et al. (2014) in studies of retirement portfolios. We also use high-frequency transaction-level data on income, spending, balances, and credit limits. When and under what conditions do individuals pay attention to their financial accounts? Can our empirical findings be explained by 'rational' theories of inattention, that is, by direct information costs and benefits? We find that inattention is selective rather than rational, and that information-dependent utility generating ‘ostrich effects’ (avoiding bad news) and anticipatory utility (an increase in current utility from looking forward to future consumption) are of first-order importance for individual attention to financial accounts. Figure 1 illustrates this. 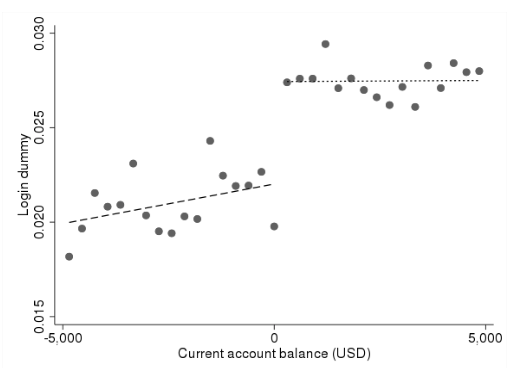 It shows a positive correlation between bank account balances and logins, and a jump when balances go from negative to positive in the raw data. Anecdotal evidence from online media suggests that it is common to be afraid to check bank account balances. jumps discontinuously when checking account balances change from negative to positive. when opportunity costs are low (that is, individuals have not many other things to do, or who have low time costs). Logging in irrespective of transactions can be ruled out. Perfectly predictable income payments caused an increase in logins. Thus, individuals could not be fully certain or uncertain about the transactions in their accounts. Transaction verification did not seem to be the main motivation for logging in. For instance, we did not find a larger login response on paydays with many other transactions, even though other transactions should increase the need for transaction verification. Login response on paydays was higher when cash holdings and liquidity were high. This would be inconsistent with hypothesis 2 as well as hypothesis 3, because individuals should have cared more about budgeting when cash holdings and liquidity were low. We find a negative relationship between logins and spending (especially time-consuming spending, such as restaurant meals and home improvement), which suggests that spending could be used to measure opportunity costs. But the response of logins on paydays is unaffected by concurrent spending. There are three important differences between attention to retirement accounts, as analysed by Karlsson et al. (2009), and our context. We know that individuals can improve their financial standing by paying more attention to their accounts (Carlin et al. 2017, Stango and Zinman 2014, Medina 2016), but we do not know whether investors have any skill in stock-picking or market timing. This implies that attention to bank accounts would be more beneficial than attention to portfolios. Uncertainty about bank account balances should be much lower than uncertainty about portfolios. This would make inattention more difficult to rationalise theoretically, and so it should be more surprising for checking accounts. We discover selective attention in an everyday activity for a broad and representative sample of the population. This implies that selective inattention is a more widespread phenomenon than previous studies suggest. Therefore we argue that our results make a general case for information-dependent utility models generating ostrich effects and anticipatory utility. To bolster this argument, we investigate how far the most widely-applied information-dependent utility model, developed by Kőszegi and Rabin (2006, 2007, 2009), can reconcile and formalise intuitions consistent with our empirical evidence - that is, that individuals incur substantial fees by being inattentive, but they check their accounts more often when they have received income and hold more cash. We find that the model of Kőszegi and Rabin (2009) generates some of our empirical findings, but not others. The assumptions of rational inattention in macroeconomic models would generate different aggregate dynamics if inattention were selective, as our findings suggest, instead of rational. We show this formally using a simple Lucas (1979) tree model in the spirit of the time-variant attention model of Andrei and Hasler (2014). Because any agent with a prudent utility function finds consumption smoothing more beneficial at low wealth levels, a rationally inattentive agent should pay more attention – in other words, smooth consumption at a higher frequency – when there is an adverse consumption shock. We assume that a selectively inattentive agent would do the opposite. We in turn show that the model’s predictions about the risky, risk-free, and equity premium’s return and volatility are substantially affected if we assume selective, as opposed to rational, inattention. Our findings also contribute to other researchers’ findings on information costs (Abel et al. 2013, Alvarez et al. 2012, Huang and Liu 2007, Van Nieuwerburgh and Veldkamp 2009, and Van Nieuwerburgh and Veldkamp 2010, for example). This study, alongside Carlin et al.’s (2017) investigation of the causal effect of paying attention to personal finances, implies that individuals are sometimes willing to pay not to receive information. Therefore information costs are time-variant in non-trivial ways, and sometimes effectively negative. Furthermore, because individuals in dire financial standings do not pay attention, making their situation worse, our findings are useful for research on poverty traps (see Azariadis and Stachurski 2005 for a literature survey) and on poverty and cognitive function (Mani et al. 2013, Carvalho et al. 2016). Finally, our findings are important for policy prescriptions or (field) experimental interventions. In these cases, it would be important to take into account that inattention is selective rather than rational (see DellaVigna 2009 for a literature survey). Author’s note: This project has received funding from Danish Council for Independent Research, under grant agreement no 6165-00020. We are highly indebted to Meniga’s Analytics Team for providing and helping with the data. Abel, B, J C Eberly, and S Panageas (2013), “Optimal inattention to the stock market with information costs and transactions costs", Econometrica 81(4): 1455–1481. Alvarez, F, L Guiso, and F Lippi (2012), “Durable consumption and asset management with transaction and observation costs", American Economic Review 102(5): 2272–2300. Andrei, D and M Hasler (2014), “Investor attention and stock market volatility", Review of Financial Studies. Azariadis, C and J Stachurski (2005), "Poverty traps", Handbook of Economic Growth 1: 295–384. Caplin, A and J Leahy (2001), "Psychological expected utility theory and anticipatory feelings", Quarterly Journal of Economics: 55–79. Carlin, B, A Olafsson, and M Pagel (2017), "FinTech Adoption Across Generations: Financial Fitness in the Information Age", NBER working paper 23798. Carvalho, L S, S Meier, and S W Wang (2016), "Poverty and economic decision-making: Evidence from changes in financial resources at payday", American Economic Review 106(2): 260–284. DellaVigna, S (2009), "Psychology and economics: Evidence from the field", Journal of Economic Literature 47(2): 315–72. Ely, J, A Frankel, and E Kamenica (2015), "Suspense and surprise", Journal of Political Economy 123(1): 215–260. Gabaix, X and D Laibson (2001), "The 6D bias and the equity-premium puzzle", in NBER Macroeconomics Annual, Volume 16: 257–330. Gherzi, S, D Egan, N Stewart, E Haisley, and P Ayton (2014), "The meerkat effect: Personality and market returns affect investors’ portfolio monitoring behaviour", Journal of Economic Behavior & Organization 107: 512–526. Golman, R, D Hagmann, and G Loewenstein (2016), "Information Avoidance", Journal of Economic Literature. Golman, R and G Loewenstein (2015), "An Information-Gap Framework for Capturing Preferences About Uncertainty,” Proceedings of the 15th Conference on Theoretical Aspects of Rationality and Knowledge. Huang, Land H Liu (2007), “Rational inattention and portfolio selection”, Journal of Finance 62(4): 1999–2040. Karlsson, N, G Loewenstein, and D Seppi (2009), "The ostrich effect: Selective attention to information", Journal of Risk and Uncertainty 38(2): 95–115. Kőszegi, B and M Rabin (2006), "A model of reference-dependent preferences", Quarterly Journal of Economics: 1133–1165. Kőszegi, B and M Rabin (2007), "Reference-Dependent Risk Attitiudes", American Economic Review 97(4): 1047–1073. Kőszegi, B and M Rabin (2009), "Reference-dependent consumption plans", American Economic Review 99(3): 909–936. Lucas, R (1979), "Asset Prices in an Exchange Economy", Econometrica 46(6): 1429–1445. Mani, A, S Mullainathan, E Shafir, and J Zhao (2013), "Poverty impedes cognitive function", Science 341(6149): 976–980. Medina, P (2016), "Selective Attention in Consumer Finance: Experimental Evidence from the Credit Card Market", working paper. Olafsson, A and M Pagel (2018), “The ostrich in us: Selective attention to financial accounts, income, spending, and liquidity”, NBER Working Paper 23945. Reis, R (2006), "Inattentive consumers", Journal of Monetary Economics 53(8): 1761–1800. Sicherman, N, G Loewenstein, D J Seppi, and S Utkus (2015), "Financial attention", Review of Financial Studies 29(4): 863–897. Stango, V and J Zinman (2014), "Limited and varying consumer attention evidence from shocks to the salience of bank overdraft fees", Review of Financial Studies 27(4): 990–1030. Van Nieuwerburgh, S and L Veldkamp (2009), "Information immobility and the home bias puzzle", Journal of Finance 64(3): 1187–1215. Van Nieuwerburgh, S and L Veldkamp (2010), "Information acquisition and under-diversification", Review of Economic Studies 77(2): 779–805. Woodford, M (2009), "Information-constrained state-dependent pricing", Journal of Monetary Economics 56: S100–S124. This research identified the causal effect of paying attention to personal finances. Individuals reduced their consumer debt in response to paying more attention to their financial accounts. One additional login per month reduced the amount of consumer debt by approximately 17% over a 24-month period. Following the terminology in Golman et al. (2016). Cash is defined as savings account balances plus positive checking account balances. Liquidity is defined as savings account balances plus credit limits plus checking account balances minus credit card balances. Checking account balances are negative when individuals hold an overdraft.